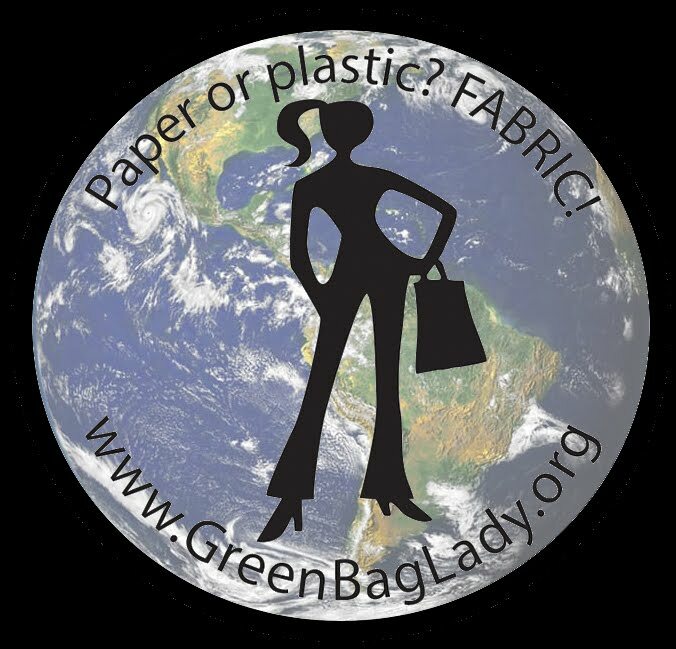 Green Bag Lady: It's a WRAP freebie! Here we are in DECEMBER already. What? Wasn't it just August. Sheesh. I was reminded recently of the impending holiday when I opened a wonderful box of donated fabric to find a huge quantity of Christmas cloth. Yes! Just what I needed to make a bunch of bags for YOU. And, what are we going to do with these bags? We are going to use them to WRAP presents, of course. There is nothing more eco-friendly than wrapping a present in a fabric bag that can be used over and over and over again. I mean, it can even be used to bring the present home from the store, for crying out loud. All you have to do is put your gift inside and then tie up the handles like a bow. Easy peasy. Hang a gift tag off the handle and you are set. Easiest. Wrapping. Ever. Even my husband can do it. I know it looks from the top photo that we have 15 bags to give away. Nooooooo, that is NOT the case. We actually have 70 (YES, 70!) of these bags. BUT, we are going to choose 35 winners and send 2 Christmas bags to each of those people. Then, if they give one away, it's all good. 35 lucky people will be picked at random to win a set of TWO Christmas bags! I totally thought these were furoshiki, but gift bags are good too. On a cool idea! Handbags as always top class! you rock! want to own one of these for Mom for Christmas! We have some snow and winter weather! We with my little son ride on a sled and make snowmen! Looking forward to the New year! This year my son for the first time to get acquainted with Santa Claus! Would love to get the same handbag for decoration gifts my kiddies! These would be great to wrap gift for my Mother-IL. Very wonderful bags! Thanck you! Hi) just wonderful bags and gift bags, very original way to wrap a gift for Christmas and New Year! I'd be happy and very grateful to receive them! You are super! Christmas fabric is so much fun, and Christmas bags are even better. Thanks for the chance to enter and to share a bag. I think it is wonderful to give a present in a fabric bag and like receiving them that way also....Have a wonderful holiday season.. I don't know how you keep doing it! You guys need to win some kind of environmental award for all the re-useable bags you send out to the world. Thank you! awesome! i love all you do! Great giveaway. 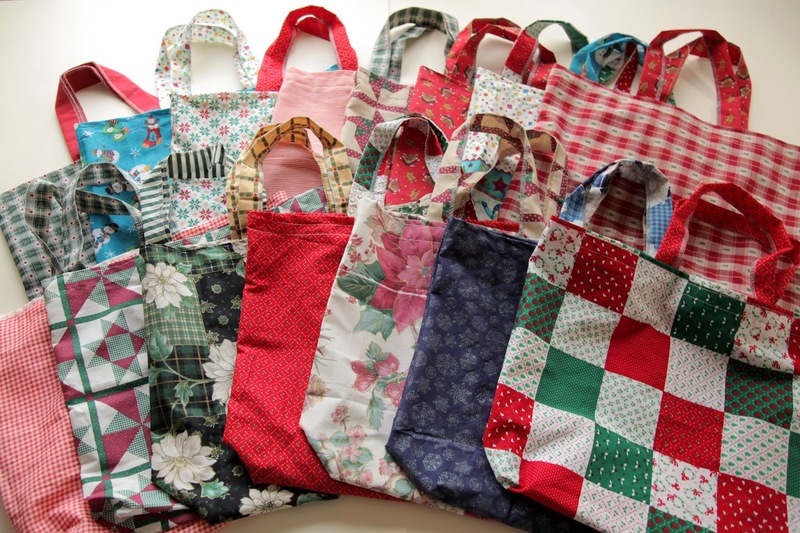 I'm still working to get my mother and sister to use cloth bags, this will definitely help the cause! 70 handbags! What a great performance! Now I'm doing handkerchiefs made of fabric and handmade lace to give the gift of new year my friends! Thanks for a change to win. I have never won something. What a fun giveaway! I have made pillowcases to wrap gifts in too! thanks! Thank you for the wonderful freebies! Beautiful bags! Thank you for the chance to win! what an absolutely fantastic idea for gift wrapping. Im off to find some left over Christmas fabric. thanks for the idea. and for the chance to win some great bags. Hello from Russia! I really like the way you do this amazing bags. It's not just a piesies of fabrics, it's a lovely creature. Carry on! Good luck! Pauline. o so nice bags! and good idea for presents. want some of them. good luck! Would love to get the same handbag! 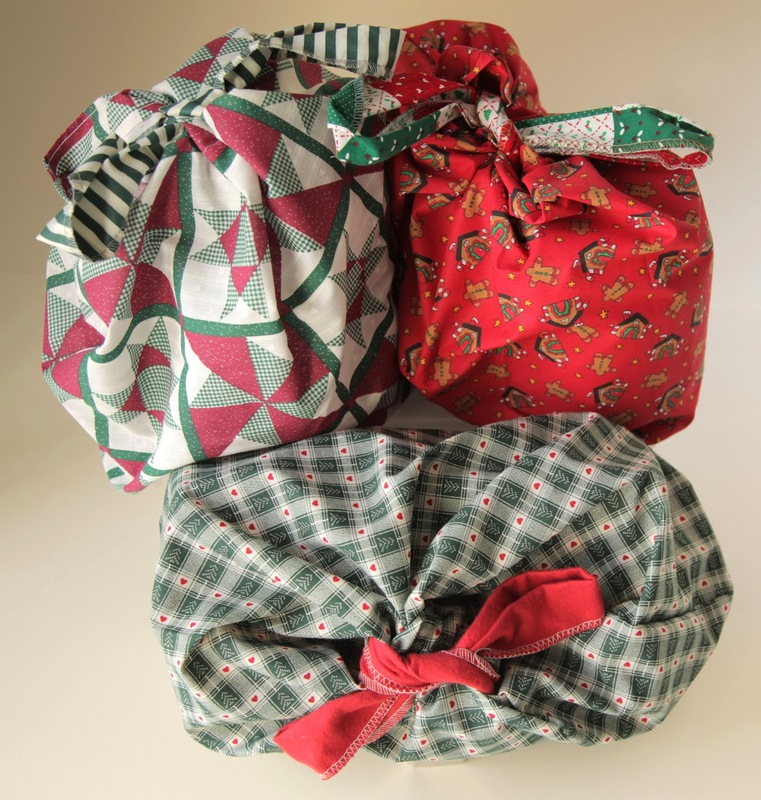 Great idea to use Christmas fabric bags to wrap presents! I'm behind on making gift bags this year -- too much to do, too little time. This would be so helpful, and so beautiful under the tree! I just love these, a great idea instead of wrapping paper! Thanks for the chance to win! Wonderful bag! Gorgeous bags and they are one thing I can never have enough of. Thanks for a brilliant giveaway. Nice Reusable Wrapping for a gift! Haven't bought wrapping paper for a couple of years. Would love to continue that practice... Everyone loves a gift in recycled/recyclable wrap! Love how festive these bags look for gift wrapping. Thank you Teresa's family that it gives us a good opportunity to get wonderful eco green bags. They look so nice and pretty and can be used not only during Christmas! Ypur mission to give people these useful and colourful bags is worth praizing. Great idea instead of wrapping paper. What a wonderful idea, to wrap a present and then have 2 actual gifts. The gift and a bag. Love this idea. It's great that Christmas is coming! I love this holiday! Really want to win! If you are lucky, will pack a gift for my son in your wonderful bag! Thank you! interesting idea for gift wrapping! A great gift for friends for Christmas! Brilliant idea, love the pattern is free too! These bags are beautiful. They're exactly what I need. I adore your bags! I'd love to win very much!!! Warping presents will be very joyfull! I would absolutely love to win one of these bags! Beautiful bags! Thank you for the chance to win!!! What great bags, how I would love one and the other I would give to my Mum or my daughter, hard decision. Think I will download the pattern and make one or several. I hail you. I desire to get a bag for my mom! Thank you. Bags are just superb! Great idea to hold such actions! Hopefully I'll get lucky.